Hydraulic impact machines are widely used in mining, construction and other industries for rock and man-made material destruction, for shaping objects and other manufacturing operations. Nowadays, there are a lot of hydraulic machines distinguished by layouts, designs and options. However, their common feature is the lack of automatic adjustment systems for operating parameters depending on the tool load. The problem is to increase hydraulic machine performance at the expense of the input power rational consumption as well as to enhance the efficiency. The paper presents the search result of systems capable of solving the problem. It is shown that hydraulic fluid flow controls and the striker travel value will lead to the automatic adjustment of both impact frequency and single-impact energy of a machine depending on the tool load. Keywords: hydraulic blow device, hydrodrummer, working liquid, energy of single blow, frequency of blows, a loading of the tool, automatic control. Pat. 2361996 Russian Federation, MPK E 21 V 1/26 Hydraulic device of blow shock action / Ushakov L.S., Kantovich L.I., Fabrichniy D.Y., Lazutkin S.L. ; applicant and patent holder of Public Educational Institution of Higher Professional Training Orlovsky GTU. – №. 2008113585/03; statement 07.04.09; it is published 20.07.2009; Bulletin – №. 20. – 1 p.: ill.
Pat. 2456424 Russian Federation, MPK E 21 V 1/26 Hydraulic device of blow shock action / Kantovich L.I., Fabrichny D.Y., Lazutkin S.L., Fabrichniy N.D., Ushakov L.S. ; applicant and patent holder of Public Educational Institution of Higher Professional Training Orlovsky GTU. – №. 2010150244/03; statement 07. 12.2010; it is published 20.07.2012; Bulletin – №. 20. 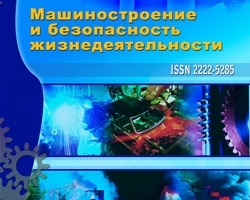 – 1 p.: ill.
Automatic adjustment systems for hydraulic impact machines according to the tool load, Fabrichniy D.Y., Fabrichniy Y.F., №4 (18) 2013, Tolengutova M. M.